For those of you who didn’t know, Linux-dash is a web-based lightweight monitoring dashboard for Linux machines, which can display, in real-time, various system properties, such as CPU load, RAM usage, disk usage, Internet speed, network connections, installed software’s, running processes and many more. The web statistics page allows you to drag and drop the various widgets and rearrange the display as you desire. This article assumes you have at least basic knowledge of linux, know how to use the shell, and most importantly, you host your site on your own VPS. The installation is quite simple. I will show you through the step by step installation linux-dash on CentOS 6. Step 1. Install Nginx, PHP and PHP modules. Step 2. Configure Nginx web server. Create Nginx Vhost for linux-dash. #nano /etc/php-fpm.d/www.conf . . . listen = 127.0.0.1:9000 user = nginx group = nginx . . . Step 4. Download and Install Linux-dash. Step 5. Restart Nginx web server as well as php-fpm. Step 6. Access Linux Dash. The linux-dash web based monitoring will be available on HTTP port 80 by default. Open your favorite browser and navigate to http://yourdomain.com or http://server-ip. If you are using a firewall, please open port 80 to enable access to the control panel. Congratulation’s! You have successfully installed Linux Dash. 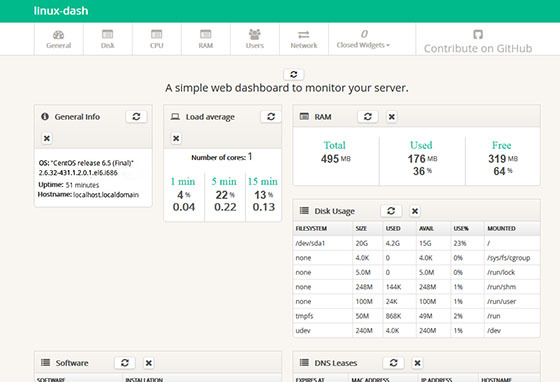 Thanks for using this tutorial for installing linux-dash web based monitoring on CentOS 6 system. Related Posts of "How To Install Linux Dash on CentOS 6"